Sometimes, the most ridiculous mistakes result in the most awesome creations! 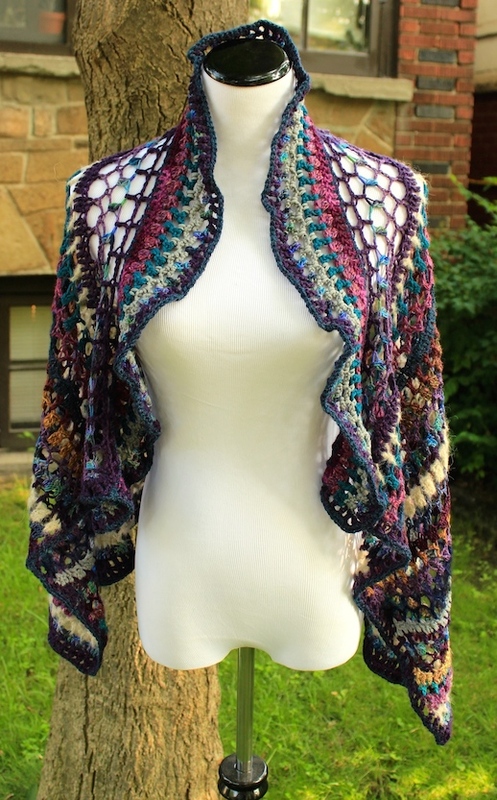 I made a few silly mistakes with this project…but in the end, I think it’s pretty funky wrap! We of course NEVER throw out those bits, do we?! 😉 I had a variety of leftover yarn that I had been saving for JUST such an occasion so I was pretty excited! Lots of colours and so many different textures! Type of yarn included: mohair, wool, alpaca, silk, merino, nepalese wool, Blue Leicester, etc. I avoided acrylic yarn and chose all natural fibres with the exception of some yarns that were a blend (IE one of them contains 50% Wool, 30% Nylon, 20% Alpaca). I admit I pulled out some untouched single skeins that had been waiting for a suitable project….as long as they matched the colour scheme of course! Yes, I did buy a couple skeins too. But I had to! The colour combination I came up with was *almost* perfect but needed a little punch so I bought a couple skeins of brighter violet and teal to balance everything out. 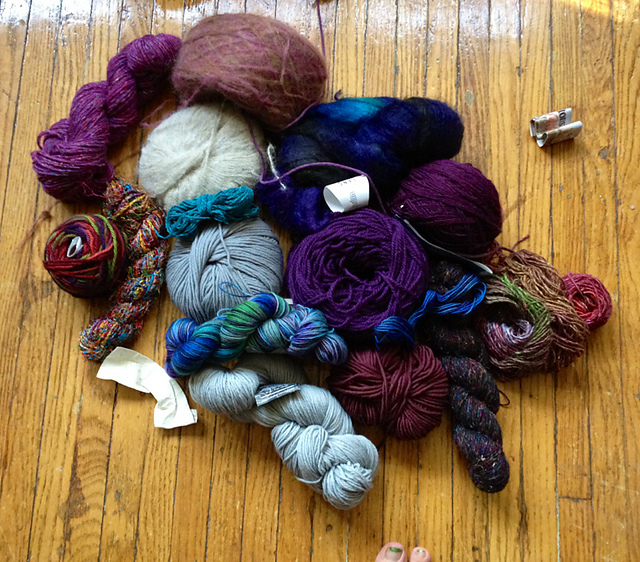 Once I had all the yarn gathered up, I began the project. Really straightforward, easy pattern to follow! Highly recommend you check it out! I approached it as a freeform type creation so I didn’t worry about gauge or hook size or yarn weight, I just crocheted row after row after row of pretty colours! What eventually happened was that it began to narrow due to the lighter weight yarns I was including. Eventually it narrowed from approximately 55″ to 42″. At that point I had mainly worsted weight yarns remaining and they resulted in a slightly thicker section that naturally folds over to create a lovely neckline and collar. I had to block it to really see how it looked and I think the resulting wrap is pretty darn cool!